Simple & Sincere: A Little Bit O' Mojo + Blog Candy! Sometimes I do these Mojo sketches and I just get overwhelmed, but I am really happy with how this turned out. I like the retro feel to this card, thanks to the Kiwi Kiss designer paper. I wish I had a stamp that said something like, "Shaken, not stirred." :) I think this would also make a fun "girls' night out" invite. I don't think I've ever even had a martini, but love this card all the same! Today is my final blog candy give-away for my blogoversary, which I've been celebrating all month long. I have had so much fun with this and I have absolutely LOVED reading all of your comments. 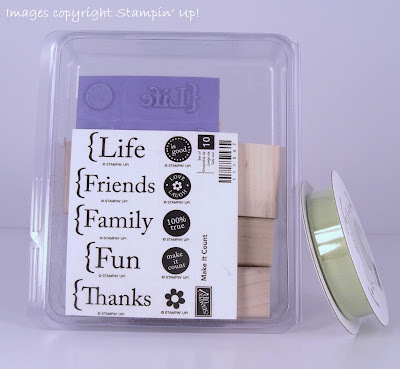 Today you have a chance to win the Make it Count stamp set (10 stamps!) and a spool of Certainly Celery poly-twill ribbon. Wahoo! Just leave me a little comment on this post and I will draw one random winner using Random.org at 8 a.m. on Saturday morning (I'm REALLY hoping I get a chance to sleep in!). Remember - if you leave an "anonymous" post, please leave your first name and last initial somewhere in your comment. I love hearing from you all and wish you luck! Heehee, I am not a drinker, but this is a cute card---the paper fits perfectly! Thanks for a chance to win--I do love your style! Thanks for a chance to win these fantastic stamps! Oh! You make beautiful cards! 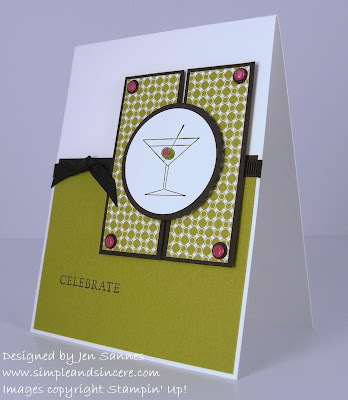 The Martini Glass on the card just makes me think of the 60's and the green fits nicely. I love the card very nice. Love your card! I could use that set of stamps! This is a great card!! I love all your work--thanks for sharing with us!! Haven't visited in a while, so Happy Anniversary. Thanks for all your great card ideas! Michelle W.
I love your Martini card. So cute! Congrats on your blogoversary and thanks for the chance to win! Love this card. Color selection is so pretty. Another great card. Thanks for celebrating your anniversary with us & offering gifts as well. That clinches it --I'm having a martini tonight! Your card is my favorite one that I've seen using that Mojo sketch. Even with all those layers, it still looks clean and simple. Fantastic job! I absolutely love your Mojo card this week! The color of the olive in the drink carries beautifully through the rest of the card. I could see a set of drink cards made with the color of the 'drink goodies' matched to the dcs as you have done here. (Why do I suddenly feel like having a Bloody Mary?) Thanks for sharing. La lalalalove this card! Very cute with the martini stamp. And, um, I think you need to have a martini this weekend - you'll love it. A flirtini perhaps! I've been checking out your blog daily and love it! Great use of colors! Thanks for the chance to win! I am so wishing that I lived closer to you. I live in Green Bay and you just seem like a person that I would love to stamp with. Thanks for all your great ideas. Love the card, and I love your blog, you are such an inspiration. Thanks for sharing your awesome talent. Have a great weekend. What a perfect card for a Friday - nice way to end a long work week! The card is so clean and refreshing with the colors you used. Thanks for the chance to enter! Hi Jen! Happy blogaversary =) You have a great little blog here! Keep up the wonderful work and thanks for doing this giveaway!! !